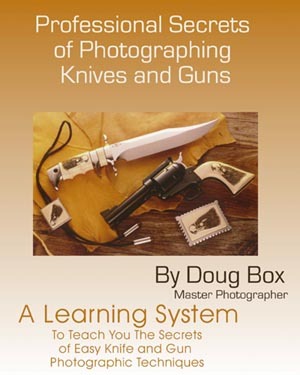 The learning system that makes up Professional Secrets of Photographing Knives and Guns was written with knife makers, gunsmiths, engravers, scrimshaw artists and other artisans in mind. The system, which consists of a 70-minute VHS videotape and a 40-page workbook, is well done and will teach you how to make quality photographs. The video is made in an informal but very educational manner. Doug Box, the author, narrates and demonstrates all the lighting and equipment set-ups in the video. The workbook has plans to build a lighting box, complete equipment list, where to get the equipment and more. You will discover how to use different types of backgrounds, props, special effects, and multiple exposures in the learning system. A low cost way to photograph your knives is to use window light, but several other ways are also covered. Every thing you need from basic to advanced techniques is covered in the home-study course. Vicki Hardin, Cutler's Cove senior photographer said "The video was great in helping me to understand the finer points of knife photography. The little secret about how to position the knife for the best view and lighting is invaluable." There is one bit of information in the video and work book that is in error. The use of the blue Photoflood bulbs for daylight is not correct. The blue Photoflood bulb is made to add fill light in a scene that is mostly lit by daylight. The light that the blue Photoflood bulb makes is not the same as daylight and if you use them as the main light source in your photograph with daylight balanced film your images will be very orange-yellow in color. This is the only technical error in the video and only applies if you are using daylight balanced film and not a digital camera. The total package is very high quality, well worth the cost, and will save you money if you do it yourself. The cost of the course is $69.00 and it is guaranteed.